How long does it take to build one of life’s most enjoyable backyards? Most people are shocked to know that you could be swimming in your new pool in as little as two weeks! Fiberglass in-ground pools offer so many advantages over traditional vinyl liner and gunite style pools. With lower maintenance, economical prices, super quick construction, and a host of shapes and sizes, you’re sure to find the pool that perfectly fits your lifestyle. Best of all, LochNess Pools will help integrate your swimming pool into your overall landscape design. You’re outdoor living space will be where you live! How will a swimming pool affect the value of my home? A pool will certainly increase your home’s value. But the biggest value is simply the fun and enjoyment a pool provides you and your family. And that’s priceless! 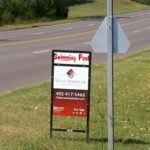 Why should You consider buying a fiberglass pool? Fiberglass pools are not only beautiful, they are affordable, quick to install and easy to maintain. Plus, they provide a lifetime of fun and enjoyment. It depends on the season. During cold weather months, you could have a pool installed in a few days. But in the summertime, when our phones are ringing off the hook, the wait is longer. That’s why it’s important to contact us now if you are considering buying a pool. Most of our customers are looking for specific things – they want a great in-ground pool that has the look and feel of a custom design without the added expense of gunite. Many of our customers are third generation, looking to put a pool in for their grandchildren. We do pools for every budget and for every stage of life. Why choose a pool from LochNess Pools? Because we are Oklahoma owned and operated, we know the special needs and requirements when dealing with native soils, shale base and clays. You won’t have to worry about the installation of your pool.